I got a few more motifs finished. It's coming along nice I think. We don't know anything definite yet about dh's job. They said they would call him next week, but it seems like he'll probably get it. I told my mom not to get too excited yet because you just never know. Of course she's so excited! He's going to have to go back down one more time for another physical and drug test. The sheriff has to look over the application and approve it also. And then we'll know for sure - I hope! ;) Well, much else going on here... just hanging out with the kids! The sampler's looking lovely! At the rate you're stitching you might get it finished before the Village turns up - it may work out really good timing! Needlecraft Corner sold her 4 dozen very quickly and I'm waiting on a second order :) I love what you're currently working on. The colors are lovely. Your Pomegranate piece is coming along nicely. Thanks for sharing your progress. I think it's one that I'd like to stitch. 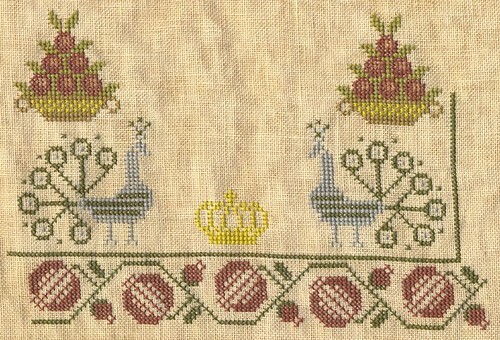 This is a beautiful sampler and you are making very quick progress!